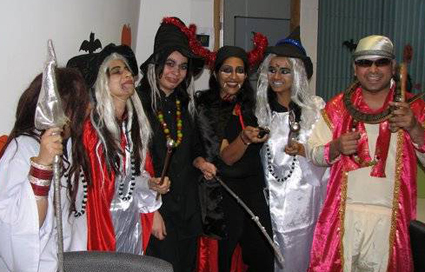 There are misconceptions about Halloween and is generally not celebrated in India as it is seen as purely a western culture. However, it is celebrated in close quarters among people following western lifestyle. One can see them celebrated in Bangalore, Mumbai, Delhi etc. It is common to see witches, warlocks, superheroes and several fictional and comical characters coming to life in clubs and pubs of these cities on October 31. The festival is more popular among youngsters here and we can see them coming to outshine each other in their best dresses. If you live in one of those cities and would like to throw a Halloween party, then Yoovite.com gives you the best online invitation tool by which to invite your friends and relatives to come over. The main attraction of Halloween is the costume of the guests. When you throw a party, you have to make sure that you have multiple themes in the same place since people have different tastes in movies, serials and comics etc. Your friends may come in fancy dress disguised as supernatural figures such as ghosts, monsters, vampires, skeletons, witches and devils. They can also come in the costumes of popular characters from fiction such as X-Men's Wolverine and Storm, Spock from Star Trek, Spiderman, Superman, Batman, The Joker, Darth Vader, Cyclops and Magneto. Most pubs and clubs organize costume extravaganza and give awards for the best dressed males and females. You can also try that in your house where you hold the party. The venue should be transformed in order to look like some horror or sci-fi movie. Hence, the lighting is very important. Further, there must be background music all along. Dark psychedelic trance music is usually the trademark of Halloween venues. Hire a DJ who can handle the music well. 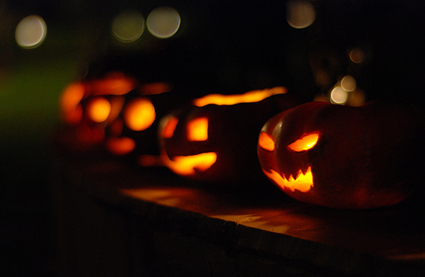 You can carve pumpkins to resemble faces and place lamps inside and create an authentic feel. You can decorate your walls with sci-fi, comic wallpapers from various movies, serials and comic books. There is no specific activity that you can take part in during Halloween. It is more of a social gathering where people get to meet and talk, dance etc. The weird costume is what makes it special. Usually Halloweens are drinking and dating parties. Many people usually find new dates in parties such as these. As mentioned, it is a drinking party. People who don’t drink can also participate but usually it is a drinking party. You need to arrange copious amounts of drinks and you must have someone hired who can mix drinks well. In your Yoovite invitation, you can ask for suggestions from your friends regarding the type of cocktails they would prefer so that you can arrange the raw materials beforehand. The food can be a buffet with proper catering. It will ensure that people get to choose what they want to eat. Having the caterers also dressed up in weird costumes is one of the best and funniest Halloween costumes ideas.